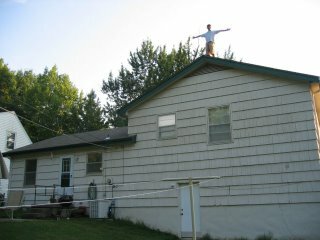 I’m Living on top of the Roof! I’ll admit it – I’m chicken. Here’s a picture of the evidence. The answer to the question – is no, I have not got a nagging wife, so I’ve taken to living on a corner of my roof. Rather, we have a bird’s nest in our roof. There’s a piece of wood missing on the far right of the picture and the little birdies are cheeping above us. So I climbed up on the roof – but was too chicken to do the repair work with nothing to hold on to but the roof – my next task is to track down a ladder that I can use to actually do the job with relative safety. I wasn’t a big fan of Shari’s idea of tying a rope around my legs and dangling me off the edge! This entry was posted in Personal Updates. Bookmark the permalink.